With our summer-long celebration of Disney’s “Frozen” at Disney’s Hollywood Studios starting on Saturday, July 5, I wanted to give you a first look inside Wandering Oaken’s Trading Post & Frozen Funland. 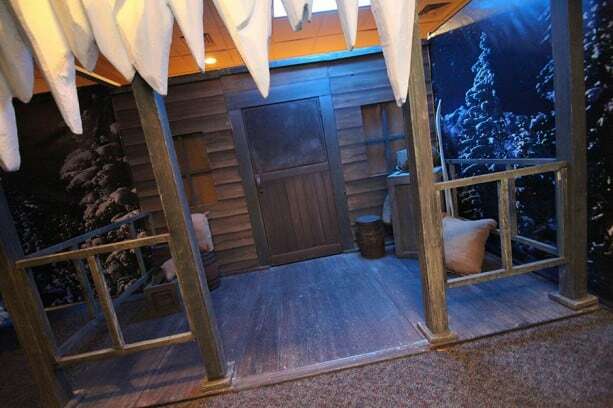 Located in Soundstage One between Toy Story Midway Mania and the Studio Backlot Tour, Oaken and his cousins have created a cold-weather wonderland filled with a frozen pond for ice skating demonstrations, photo opportunities, play areas, food and beverage kiosks, and a merchandise shop. Upon entering Soundstage One, guests pass by the trading post front porch on the way to the frozen pond and the merchandise location. 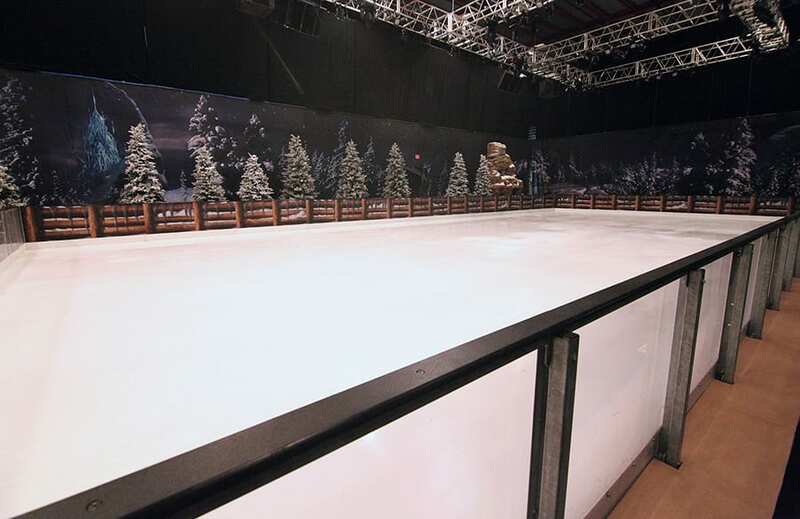 My first stop was the ice skating rink located in the same space recently occupied by Darth’s Mall during Star Wars Weekends 2014. Surrounded by snow-covered trees, I couldn’t believe my eyes when I saw the pond – it’s summer in Florida and I was staring at ice! I haven’t been skating since I lived in Ohio many years ago, so I can’t wait to go. My next stop was the trading post, which is located in the front area of Soundstage One. This location will be home to a large assortment of “Frozen” merchandise. I found dolls, toys, plush, apparel, consumables, pins and much more. The assortment will evolve throughout the summer as additional items arrive at Disney Parks, like the recently discussed Olaf merchandise I shared in this article. We will be releasing a new D-Tech on Demand cases for iPhone 4/4S and iPhone 5/5S on Saturday at Disney’s Hollywood Studios. This artwork will also be added to the D-Tech on Demand boutique inside the recently opened Marketplace Co-Op in Downtown Disney Marketplace. The Marketplace Co-Op location will have a few designs not found anywhere else, while the “Frozen Summer Fun” design will only be found at Disney’s Hollywood Studios. Coming next week, we will release three open edition, retail MagicBands at Disney’s Hollywood Studios with pre-printed images of Elsa, Anna and Olaf. As with all retail MagicBand purchases, guests must present one of the following for the MagicBand to be linked to at the time of purchase: valid theme park admission, Memory Maker card or another MagicBand. These items will not be available for purchase online or via Merchandise Guest Services. I hope you are able to join us this summer as the celebration runs through September 1. Below is a gallery of a few additional things I found during my visit. 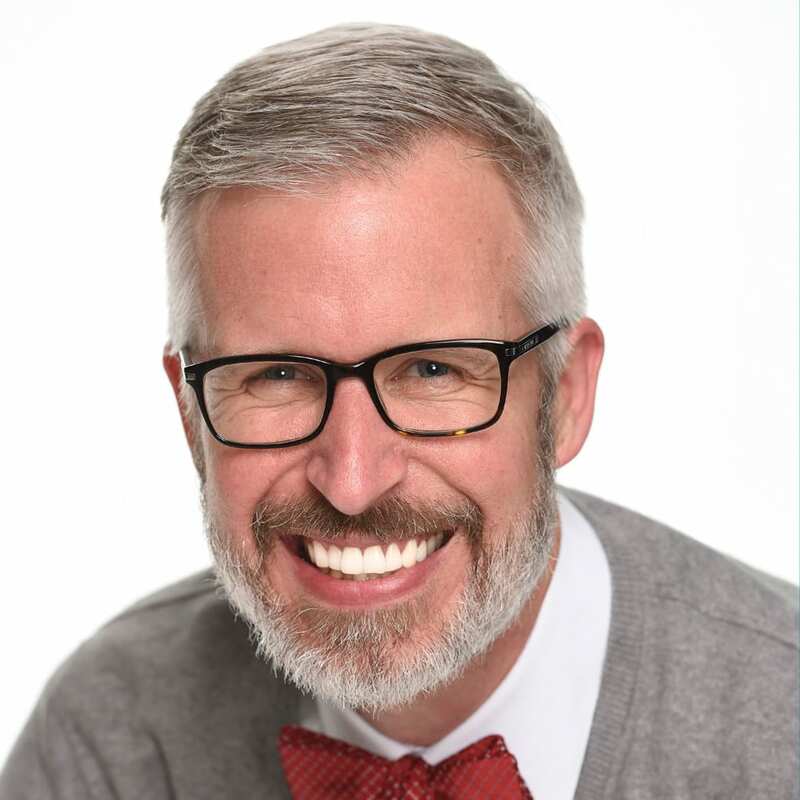 Steven – do you know if they will ship merchandise from the stores in the park? We are trying to find an Elsa dress before our trip in November, and as you can imagine, it has been next to impossible! I think the Frozen magic bands look really cool. No pun intended. I’m a bit surprised though that Disney does not offer an option to upgrade to a band like this when booking a Disney vacation. It seems like it’s something that there would be a demand for. OMG please tell me that the Frozen trading post will be there when I go in October for food & wine. I adore Sven but can’t find the plush doll anywhere and I would definitely want to buy him as well as other Frozen items when I go. I just came back on June 1st from my summer vacation at Disney and searched high & low for Frozen items with no luck and I’m thrilled that this is coming out. Please tell me that we will have more items like these all year round??? Hi Steven, is this just for summer? We are going at the end of October…I was almost going to skip Hollywood Studios but I certainly wouldn’t if this will be there!!! @Misty – The celebration will run through September 1. I hope you have a great trip in October! Hollywood Studios is our 3rd park (4 day ticket). Is there a way to buy the magic bands before when we arrive at Disney (without entering Hollywood Studios) or do we have to wait until day 3 of 4 to buy these bands? @Melissa – At this point, the only place the retail MagicBands with characters from Disney’s “Frozen” is offered is Disney’s Hollywood Studios. We are not currently offering them at other locations at Walt Disney World Resort. I hadn’t seen that article. Thank you Steven. Also, is it $10 PER half hour or just half an hour? Can you pay for more time? Just wondering since I think 30 minutes should be enough time but I just wanted to know because some of the members of my party may want to skate for a longer amount of time. @Naomi – I spoke with the merchandise team at Disney’s Hollywood Studios. They said the fee is $10 per half hour. If you wish to extend, you would need to pay another $10 for the additional 30 minutes, etc. I hope you enjoy it. I saw the place on Sunday and it looks like fun. 1. 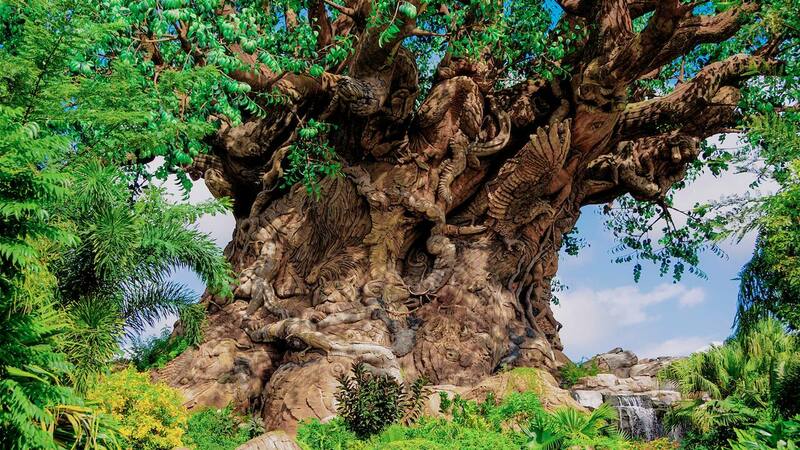 Visit http://www.DisneyParksBlog.com – We have stories pretty much every day of the week. 4. Subscribe to the RSS feed using a news reader. The link to that option is at the top of this page. i know this is hard to predict, but we will be there the week of August 9, will they be keeping the MagicBands in stock pretty well? Hope so we are so excited!!! @Michelle – You are correct that it’s difficult to judge availability for 30 days or so from now. I know that we will continue to receive additional orders. Does anyone know if they have the Anna dresses? My niece would love one for her bday but I don’t want to drive all the way up there (2 hours) if they don’t have them. @Amanda – When I was there on Sunday, I did see both Anna and Elsa dresses. Availability, however, is subject to change. I know we will continue to receive orders of the dresses and other items in the coming months. I know it costs $10 per person to go skating but does that include the skates or do you have to pay extra to rent them? If you have to pay extra, how much does it cost to rent the skates? Can I get a customized band if I HAVE the already registered/ linked magic band for a family member who can not be with us? (my daughter who is in college would like Elsa). @Thomas – In order to purchase a retail MagicBand, you must present some kind of RF media such as valid theme park admission, a Memory Maker card or another MagicBand in order for it to be linked. If we are annual pass holders and have magic bands already, do we have to pay for the frozen magic bands? @Jessica – Yes, Annual Passholders would still need to purchase retail MagicBands. Hi Steven, thanks for all of your great info. I was curious if they are still selling the star wars bands from earlier this summer? My family will be there at the end of July. My son and I are leaning more towards the star wars while my daughter and wife are leaning towards the frozen bands. @Scott – You’re welcome! Yes, there are still some quantities remaining for the limited edition Star Wars Weekends 2014 MagicBands. The best places to check at Disney’s Hollywood Studios include Mickey’s of Hollywood, Legends of Hollywood or Stage 1 Company Store. 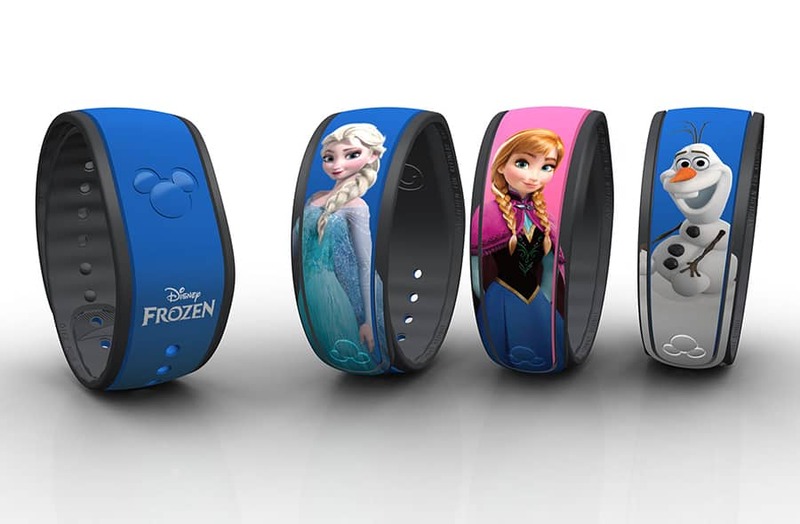 The retail MagicBands for Disney’s “Frozen” may will be at Disney’s Hollywood Studios starting Saturday, July 5. I’ll receive final confirmation early tomorrow morning. You can find the retail MagicBands at Disney’s Hollywood Studio in the following locations. Olaf will only be found at Wandering Oaken’s Trading Post. As a reminder, guests must present one of the following for the MagicBand to be linked to at the time of purchase: valid theme park admission, Memory Maker card or another MagicBand. @Stephanie – I’m glad to hear! My recommendation would be to visit D-Tech on Demand at the Marketplace Co-Op in Downtown Disney Marketplace. There, you can create a custom D-Tech on Demand case from a selection of more than 125 pieces of artwork. I know you can also select your bumper color. If we are already getting regular bands, can we trade them in and receive a lower cost on the upgrade? Steven – we have reservations for August and need to order our MagicBands by July 15th — can we request the Elsa and Olaf MagicBands since we have a reservation already? @Nancy – Glad to hear you will be visiting us. Unfortunately, that is not an option as the retail MagicBands are not offered as part of the reservation process. You could, however, purchase retail MagicBands once you get to Walt Disney World Resort. Any chance that the ice rink will be around past the summer months? @Tracey – I only know the celebration of Disney’s Frozen is scheduled to run through September 1. I’ve not heard of any other plans to extend it. Sorry. Love the Olaf band. Can’t wait, will be there in a few weeks. My boys loved the Star Wars bands from SWW. Are those still available? @Kristin – I saw a few of the Star Wars Weekends 2014 MagicBands when I was at Mickey’s Of Hollywood in Disney’s Hollywood Studios on Wednesday this week. They are a few remaining quantities also offered at other merchandise locations at Disney’s Hollywood Studios such as Stage 1 Company Store or Legends of Hollywood. My wife and daughter are going to go NUTS! All of this stuff is fantastic! I see where a portion of our souviner shopping will be. 🙂 Steven, any word on when we will be getting a sneak peak at the Ear Hat and High Heel ornaments for 2014? so excited that my girlfriend and I will be able to hang out with Oaken and his “cousins”! 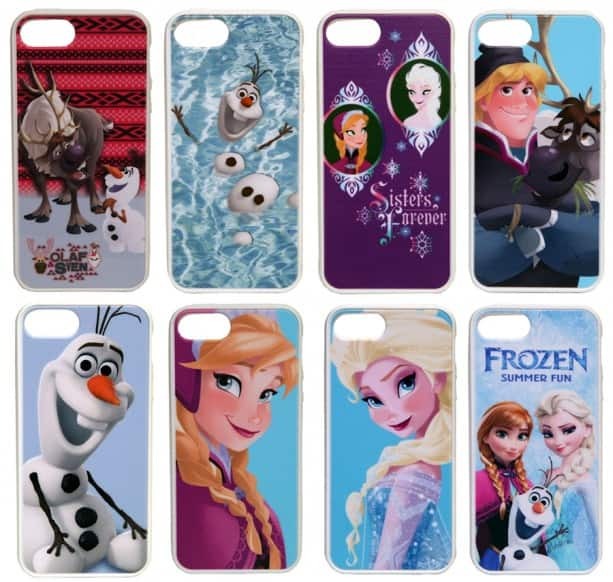 @Steven – is there any way the new phone covers will be available online through the Disney Store? @Adrea – We do not offer the custom D-Tech on Demand cases via the Disney Parks online store or Merchandise Guest Services at this time. This looks great. We will be there in August. My daughter was one of the figure skaters in Bryant Park, New York for the Frozen Sing-A-Long on Good Morning America. We are going to bring her skates (but not her Frozen costume). My son wants to bring his hockey skates too. Apologies for my ignorance. Will these be made available to select when customizing the magic bands before arriving? We’ll be there at the end of August. @Nicholas – No apologies needed. These are retail MagicBands which are different from the ones that you receive when booking a Walt Disney World Resort vacation. The open edition retail MagicBands are $19.95 each. You can purchase them when visiting and link them to your account at the time of purchase. @Christy – Check the image gallery. The display team added a sauna image with the family to a backstage door. It made me laugh. Will there be any new plush items other than the previously released Olaf and Sven? I am hoping for plushes of the trolls from the film to come out at some point. Ay chance of that happening for this event? Thanks! @Lauren – I’ve not seen any plans for new plush at this time. I know that a reorder for the previously released animated Olaf plush is coming soon. I am super excited! We arrive Sunday–We are going to the parks beginning Monday. Where to go to get the special MagicBands? I was hoping to get them Sunday before we go into the parks. We have breakfast at Hollywood and & Vine Monday morning. Is that when I should buy them? Any help would be appreciated!! I received word early this morning that the retail MagicBands may will be at Disney’s Hollywood Studios for the kick off of the event. Once I receive confirmation, I will update accordingly. Please note the locations where you can find the retail MagicBands at Disney’s Hollywood Studios. Olaf will only be found at Wandering Oaken’s Trading Post. Is this located where Darth’s Maul was during the Star Wars weekends? @Anna – That’s the place 🙂 I couldn’t believe that Darth’s Mall was there just a few weeks ago. Looks so much different now. It says coming next week you will have the magic bands, does that mean this weekend July 5th or starting July 12. @Bailey – The retail MagicBands won’t be at Disney’s Hollywood Studios on Saturday, July 5. I was only told “next week” as I don’t have a confirmed date. They will be released at some point next week. I received confirmation that the retail MagicBands will be released on Saturday, July 5 at Disney’s Hollywood Studios! Will the ice skating rink only be open until the end of summer? Also, any chance the magic bands will be available in the fall? My nieces would flip for these! @Theresa – The summer celebration will run through September 1. The retail MagicBands are open edition which means there is no finite production number. They can be reordered as long as they continue to be popular with Guests. Wow, I love the Kristoff and Sven DTech design! I really wish they did them for things other than iPhones! Steven, you said the MBs would be available “next week.” Does that mean they will NOT be for sale Saturday the 5th? Do you have a date they will arrive? Thanks! I have possible good news. I learned this morning that the retail MagicBands may be at Disney’s Hollywood Studios tomorrow morning, Saturday, July 5. I should have confirmation early tomorrow morning and will update accordingly. If I know someone is coming down can they buy the frozen band in advanced for me and then when I come down for my trip in December I can have the bands synced when I check in? This way I don’t have to get a band, check in, go to hs and have the new band synced. @Amanda – The retail MagicBand has to be linked to RF media at the time of purchase. Unfortunately, there isn’t a way to purchase and link at a later date. Sorry I don’t have better news. So exciting!! Have to admit that I am a little disappointed that this is not expected to last beyond early September because we will miss it and the kiddos would LOVE it! My girls are big Frozen fans (obviously) and would love the MagicBands. We’re not going until November. Will the MagicBands still be available then or are they ending in September? @Damon – How wonderful! I hope you have a great trip. These three retail MagicBands are open edition which means they can be reordered as long as they continue to be popular with Guests. I’m super excited about the MagicBands. I even started a website for MagicBand collectors! You stated they are open editions…. does that mean Disney will be trying their best to have them available all of the way through the end of August? I won’t be able to get there until the end of July (I’m a local but on vacation in Seattle) so I’m hoping Disney will be replenishing stock on these constantly? @Ethan – I’m glad to hear you are a fan! 🙂 Since these retail MagicBands are open edition, there is no limit on production. In other words, they can be reordered as long as they continue to be popular with Guests. They are different than the previously released limited edition retail MagicBands for Star Wars Weekends 2014. Those items had a finite production number which means they won’t be reordered once they are sold out. If that is the case can my son who lives in FL take my magic band for me and buy me one and link it with my band? @Cheryl – From my understanding, the retail MagicBand needs to be linked with some type of RF media at the time of purchase. Can’t wait! I’ll be there July 5th! How much will the magic bands cost? @Stefani – These open edition retail MagicBands will be $19.95 each (plus tax). And the good news is that the retail MagicBands will be at Disney’s Hollywood Studios on Saturday, July 5! I’m waiting to confirm with the team and will update once I know more. Steven, I’m wondering if these MagicBands make a custom sound like the SWW Bands do. Thoughts? Is there a way to get the special Frozen Magic Bands without going? Please note that Olaf will only be found at Wandering Oaken’s Trading Post & Frozen Funland. Unfortunately, there isn’t another option to get them outside Disney’s Hollywood Studios like the online store or Merchandise Guest Services. Guests must present one of the following for the MagicBand to be linked to at the time of purchase: valid theme park admission, Memory Maker card or another MagicBand.